Imagination alights at Grace Dieu! 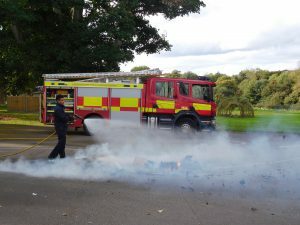 Our Year 1 and 2 pupils have, literally, set fire to their imagination! They recreated Pudding Lane by making Tudor houses and the infamous bakery where the Great Fire of London started. 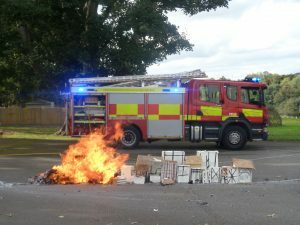 Members of the Leicestershire Fire and Rescue Service then started a fire in the bakery to show the pupils just how quickly it could spread. 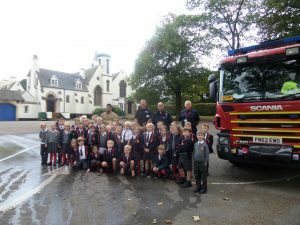 Unlike London in 1666, the Fire-fighters from Coalville Fire Station had all of the right equipment to put out the flames – which the pupils not only enjoyed watching, but luckily had the chance to help out too! For example, through just this one topic the children have, in History, sequenced the timeline of events, in English they have written diary entries from the baker’s family, written newspaper articles about the fire and written instructions for a recipe for Tudor buns. The children have, of course, also made and tasted the buns too! 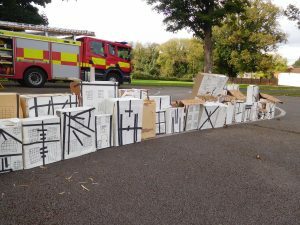 They have also been creative, drawing pictures as well as creating their own Tudor Houses from recycled materials. 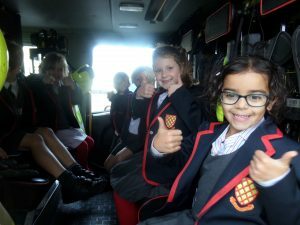 Once the fire was out the pupils all had the opportunity to learn more from the Fire fighters and enjoyed the first-hand experience of exploring their truck. It was a truly brilliant afternoon for all involved.